LG’s E8 OLED sets the bar of excellence well into the stratosphere for premium TVs. With five years of reviewing OLED TVs under my belt, you’d think I’d be immune to their wiles, but moments after LG’s 55E8P OLED TV was turned on, so was I. As I basked in the E8’s perfect black levels and brilliant color, I was served a not-so-subtle reminder that my brain isn’t capable of storing all of the sensations associated with what it’s like to watch an OLED TV. Some experiences in life are infinitely better than the mere recollection of them — such is the case here. The E8 OLED may not be the best TV you can buy in 2018 (that honor currently belongs to LG’s C8 series OLED), but a juiced-up sound system and enhanced design promise to catch the eyes (and ears) of cinephiles who value simple setups over complicated entertainment systems. LG’s E8 OLED is straight-up gorgeous, but that doesn’t necessarily mean it’s the right TV for you. In this review, we’re going to hone in on what LGs 2018 OLED TVs do better than others, then we’ll take some time to discuss whether this is a TV that will serve your viewing habits best or if you should look elsewhere. The E series OLEDs of the past have distinguished themselves from other models in LG’s line-up with their “picture on glass” design. Though it looks like LG has simplified the marketing message to just “glass,” the effect is the same. The E8’s OLED panel is mounted on a sheet of glass, but you don’t catch that at a glance. What you do see is a transparent material that runs the lower border of the TV. If the TV is mounted on the wall, then the glass is the last thing you see on the television. When stand-mounted, however, the glass takes on a dual-purpose role by serving as part of the stand itself. 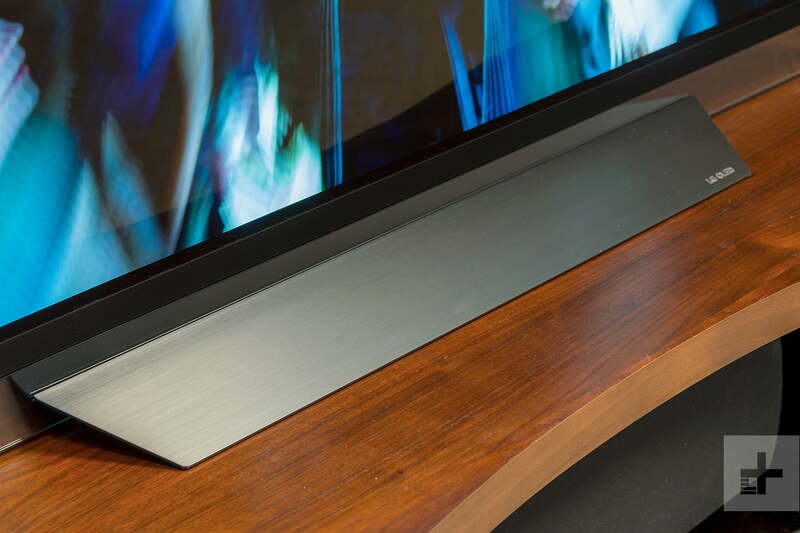 The brushed aluminum pieces you see serving as a base for the TV are slotted perfectly to allow the glass to slide right in, essentially letting the stand click into place. There are no screws to deal with here, which we appreciate a great deal. Whether on a stand or on the wall, this LG E8 OLED TV classes up any room it is placed in. 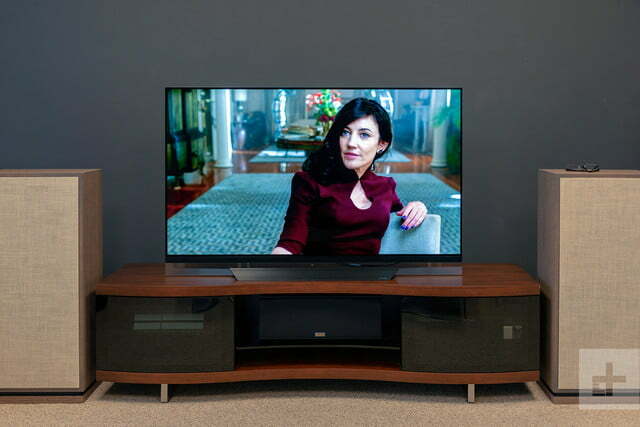 Despite the necessary bump-out on the back, which houses electronics and some of the TV’s speakers, the E8 maintains an exceptionally thin and elegant profile, thus delivering on the notion that if you pony up a few extra bucks, you’ll be rewarded with a stunning TV. Stepping back to take in the TV from a more distant perspective, you’ll notice a thin black strip separating the OLED panel and the glass. This is a new style of speaker system for 2018, and we’ll dig into that a bit later. 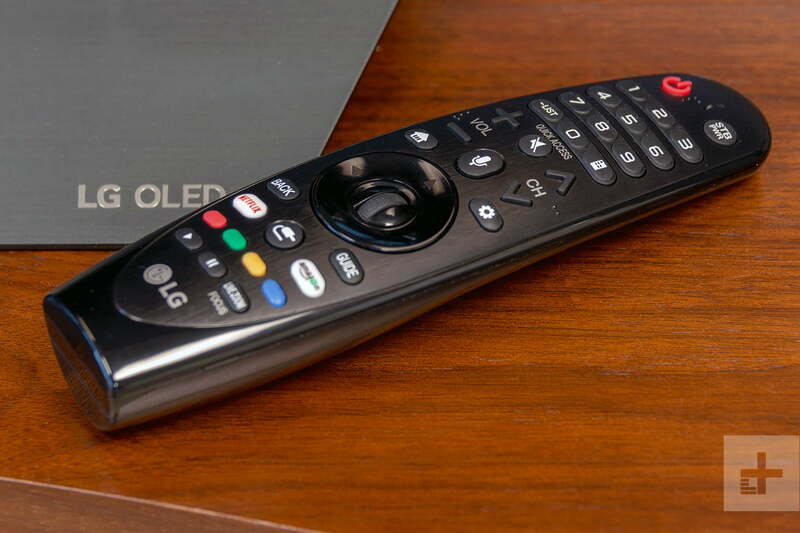 The TV comes with LG’s hallmark Magic Motion remote, batteries for the remote, product literature, and nothing else … because you don’t need anything else. 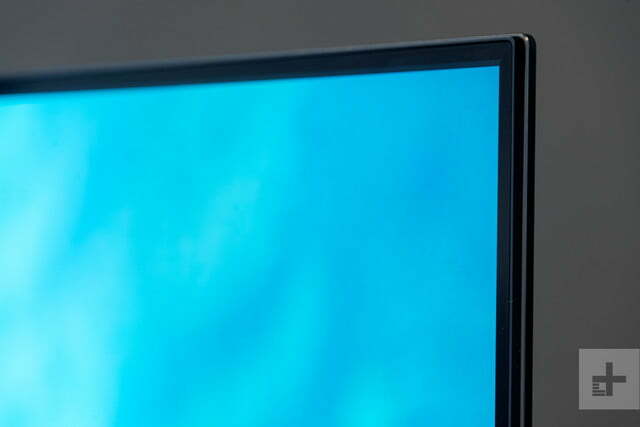 Outside of refreshed exterior design and some audio modifications, the two remaining differences between last year’s E7 OLED and the 2018 E8 OLED are LG’s new a9 (Alpha 9) processor and the implementation of LG’s ThinQ AI. Calling ThinQ AI artificial intelligence is a bit of a stretch, but the intention is to convey the notion that the system is more intelligent and capable of learning over time than other TV built-in digital assistants. LG implements ThinQ across a broad selection of its major appliances and mobile devices too, and they are all meant to work together seamlessly. That’s all well and good if it works. But does it? Thank God, yes it does. You would think the experience with the Google Assistant would be the same, whether it was built into a small stand-alone speaker or into a TV. But as we’ve experienced over the last few weeks, that is far from true. The Google Assistant as baked into Android TV (Sony TVs in particular) is limited in its abilities outside of content searches. On the other hand, the Google Assistant as built into a Google Home mini speaker is much more helpful but using it to control a TV feels anything but natural. With ThinQ built in LG TVs, the Google Assistant is more powerful and helpful. You can use natural language to get help switching inputs, switching TV stations, turning the volume up or down, having the TV shut down when a TV show is over, or having the TV remind you when one of your favorite shows is about to air. 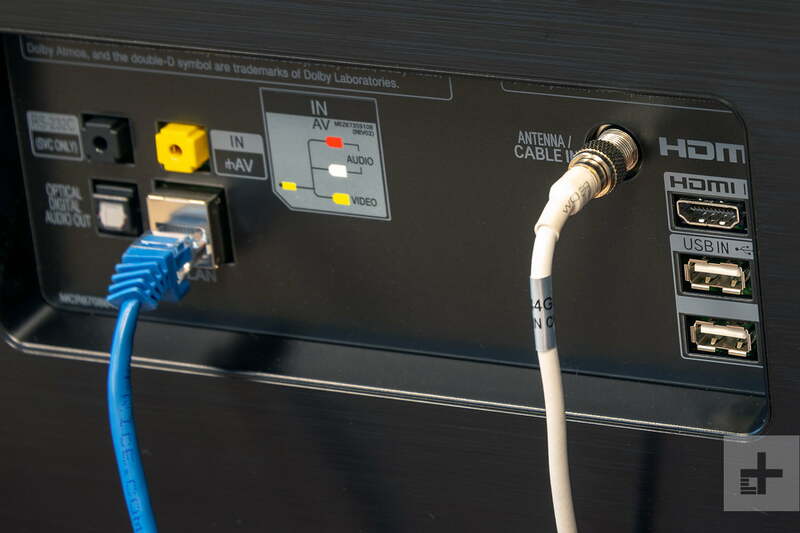 ThinQ also made finding what we wanted to watch – be it through our cable provider, over the air with an antenna, or on a streaming service – far easier than we’ve experienced from competing TV brands. This isn’t to say I think everyone is going to get on board the voice-command train all at once, but with LG’s ThinQ system, I can finally see the future taking shape. If we were to look to Samsung’s Bixby or Sony’s Android TV for an indication, the outlook wouldn’t be so bright. In other words: LG’s ThinQ voice-recognition system is the only one worth using right now. I also appreciated that LG threw gamers a bone and set the E8 up to recognize game consoles when connected. We connected a PlayStation 4, instructed the TV to “switch to game console,” and not only did the E8 tune to the correct HDMI input, it set the TV to its gaming picture preset, thus reducing the lag (which, I’m told by trusted colleagues, is under 20ms) and bumping up the brightness. With all of that praise administered, Amazon’s Fire TV Cube is the way to go if you want voice control over your entire entertainment system and not just your TV and smart home devices. As for the a9 processor, most of its benefits aren’t so user-facing that we want to dwell on them. The short version of the story is: The LG E8 is more powerful and refined than any OLED of the past, with some of the best picture processing available on the market today. Good enough? Good. It will shock nobody that we’re head over heels for how beautiful the LG E8 OLED’s picture quality is right out of the box. By nearly every metric, it sets the standard for excellence. Never mind maximum nit counts taken out of context which mean little to nothing to almost everyone outside of the TV reviewer and video enthusiast community: This TV has got it where it counts and has it in spades – whatever ‘it’ happens to be for you. From 4K HDR YouTube videos, to reference-quality Ultra HD Blu-ray discs, to some of our streaming favorites from Netflix and Amazon, the LG E8’s picture quality remained magnificently impressive and perfectly comfortable to watch. My favorite moment during my evaluation period was when I pulled up Netflix’s Ozark to see how the E8 handled Dolby Vision HDR. With only the shades drawn to block out intense light, I pressed play and grabbed my notebook. No less than 45 minutes later, I realize that I had been completely sucked in and forgotten where I was and what I had set out to do. To be fair, my suspension of disbelief can be credited in some part to the fact that Ozark is a gripping show. But the main reason I got completely lost for so long was because the LG E8 OLED didn’t do anything to distract me from the content. There were no backlight halos, no grayed-out black sections, no uncomfortably bright specular highlights, no loss of shadow detail … nothing that could have triggered my TV reviewer’s Spidey-senses and brought me back to reality. For me, this is the ultimate compliment that can be paid to a video or audio component. Anything that allows for uninterrupted suspension of disbelief and deep immersion into entertainment is a success in my book, and that’s what I experienced here – for the first time in a very long time. 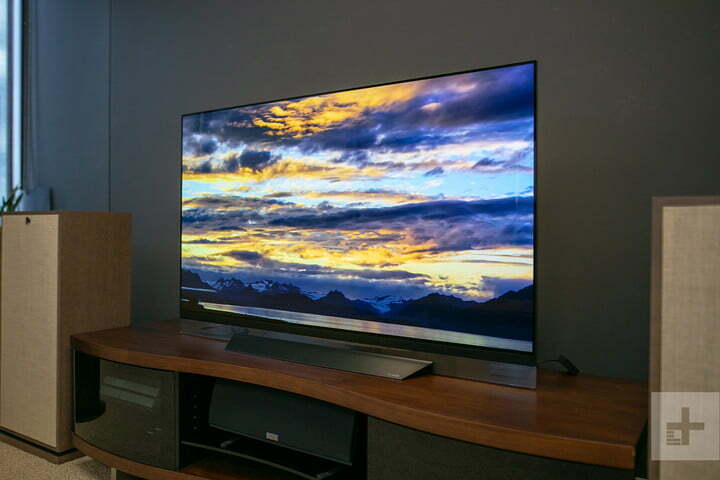 Those who buy a TV with its sound as a qualifier are few and far between these days, but since the E8 OLED carries a premium for its sound quality, I figured it was worth digging into. Word on the street is that some folks don’t care for the sound quality of this TV, and I’m having a tough time understanding that. Whatever the case, I think the TV sounds pretty damn great considering how impossibly thin it is. 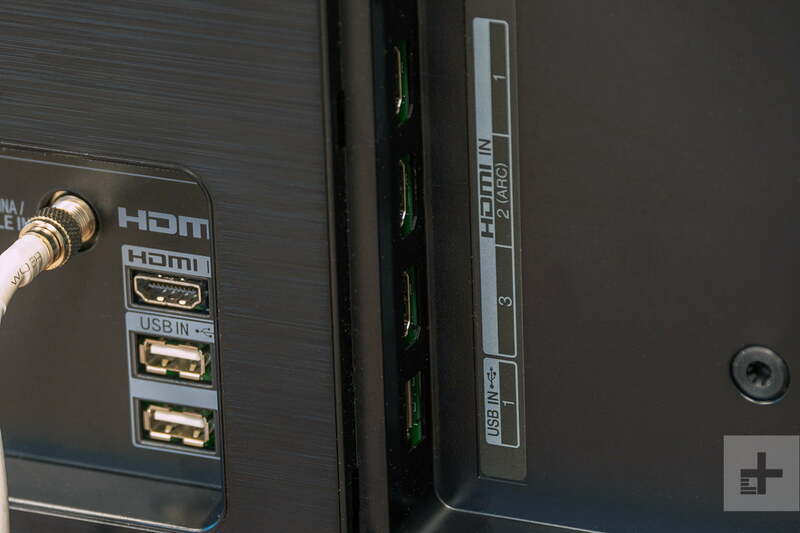 Perhaps it’s the use of the Dolby Atmos moniker that is upsetting home theater enthusiasts, or maybe it’s the appearance of the little black speaker strip along the bottom that upsets the aesthetic for some folks. Whatever the case, I think the TV sounds pretty damn great considering how impossibly thin it is. 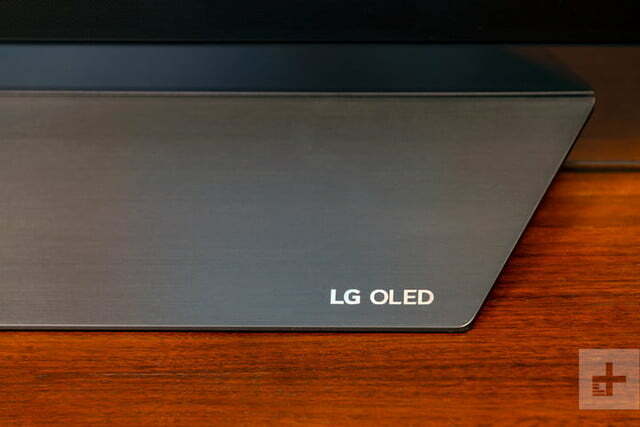 By utilizing some bass drivers in the bump-out around back and carefully crossing them over with the thin speaker strip up front, LG has created a TV that sounds far better than it has any right to. Sure, a proper soundbar or an even larger speaker system would sound more refined and maybe add some spatial cues to the soundstage, but what you get from the TV on its own is plenty impressive. After seven years of railing on flat-sounding flat-panel TVs, I’m going throw LG some props here. If you turn on a news channel like CNN or Fox News and leave that station playing literally all day, several days a week, then you need an LED/LCD TV. OLED is not built for that kind of … well, abuse, for lack of a better term. If you do treat an OLED TV that way, you will get a sort of burn-in effect and will see the ghost of a news ticker laying over everything you watch – it’s not fun. The same goes for those who play one video game title with the same static images on-screen for hours at a time, several days a week. No OLED for you. Go get an LED/LCD TV. May we suggest one of these? If, however, you watch three to four hours of TV per day on average and toss a few movie nights in each week for some added fun, then we’re confident the LG E8 OLED is one of the very best choices you could make. If you are a cinephile and want the very best black-level performance the purest reproduction of the content you are watching, the LG E8 is among the very best you can buy. If you’re loaded to the gills and you just want to say you got the best even though you can’t tell a pixel from a piranha, buy the LG E8 OLED – hell, buy three of them – and tell people a guy you knew said they were the best, so you got them, and dammit if he wasn’t right! LG offers a limited one-year parts and labor warranty. OLED panels are expensive, so if anything goes wrong with the panel itself, the whole TV will probably need to be replaced. This shouldn’t be an issue for most folks as we’ve seen LG’s quality control process in person and the sets they ship are well-vetted. 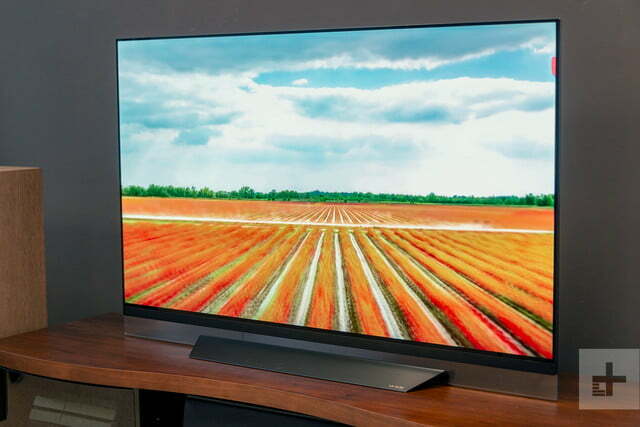 LG’s E8 series OLED is one of the best televisions produced to date. You’ll pay a premium over the less-expensive C8 and B8 series TVs, but if you want the glass, class, and upgraded bass, the E8 does a nice job of dressing up your media room while enthralling you with some of the most gorgeous, rich images you’ve ever seen. The most obvious alternative here is the less expensive LG C8 series OLED, which offers the exact same picture quality in a slightly different design and with less impressive sound quality (still decent, though!). For roughly the same price ($200 less per model), it would be worth looking at Sony’s A8F OLED for comparison. Sony has big processing chops and you might like their approach to picture quality a bit better, but you’ll have to deal with Android TV, too, which could be a deal-breaker if you don’t use something like a Roku or Fire TV to stream content. The Samsung Q9FN (check out our review!) is also a strong contender in this price range. 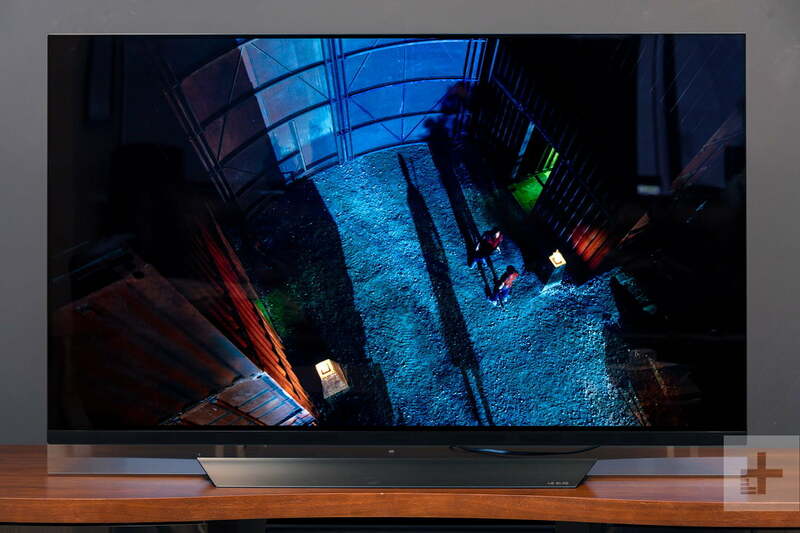 While not an OLED TV and devoid Dolby Vision HDR, it is the best premium LED we’ve tested so far. It’s impossibly bright, extremely colorful, and its ease of use and slick design is unprecedented. Bixby voice control is a big letdown, and it can’t do blacks like OLED (which is a big deal) but the Q9FN does everything else so fantastically well, you might not care. OLED TVs use organic compounds to produce light, so they will wear in time. However, an OLED TV’s pixels have about a 100,000-hour half-life, so the TV should last long enough until you would want to get a new one anyway. Do buy it if you want an upscale OLED TV with classy design and solid sound quality. Otherwise, look at the less expensive LG C8 OLED, which we consider a top pick for 2018.